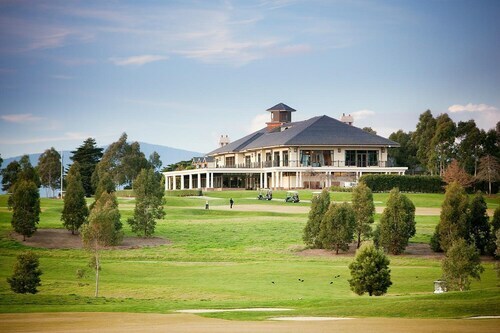 Part of Victoria’s beautiful Yarra Valley, the town of Healesville is only 52 kilometres outside the heart of Melbourne. It is close to the many delights of the city , yet far enough away so you can enjoy a relaxed break in gorgeous surroundings. It’s a popular vacation spot with lots of fantastic attractions for you to enjoy when you Book your Healesville accommodation with us. Named after a former leader of Victoria, Richard Heales, Healesville grew as a town in the 1860s on the back of the Gold Rush. The town has been featured in a number of films and TV shows. Nature lovers can spend long days exploring the beautiful surroundings, with mountains, hills, fields, valleys, rivers, and farms to enjoy. There are a number of vineyards and wineries that make for a pleasant excursion, and you can also taste an assortment of locally-produced wines and cheeses. Visit Mount Rael Lodge for some incredible views over the lush landscapes. The Maroondah Reservoir is within easy reach, and there you can enjoy a picnic or BBQ, wander through the lovely gardens, and admire superb views. Badger Weir Park is another top outdoor spot that boasts a selection of great walking trails. Visit the Healesville Sanctuary to see many animals, birds, and reptiles in partially open enclosures and ride on the scenic Sunday tourist train. The main shopping and dining hotspots are located along the green and leafy Nicholson Street. There’s a large supermarket and a shopping centre, as well as small specialty shops and other stores. There is a good choice of restaurants, or you can join the locals and head for a fabulous meal at the local Healesville hotel, which sources locally-produced fruit and vegetables grown bio- dynamically nearby and which has recently had a makeover. You can also head to the Healesville Sanctuary at the Zoo, or take a fab picnic hamper with you to enjoy in the Zoo grounds. For something completely different, head to the Werribee open plain zoo, which is about an hour from Healesville, and go on an African Safari. If you haven’t been to the Serengeti and long for the experience, Werribee Zoo is about as close as you can get to the real thing. You’ll spot lions and tigers, elephants, rhinos, giraffes, zebras and hyenas. The easiest way to get here is with a cheap flight to Melbourne. The area is well-connected by public transport and there are lots of comfortable and inexpensive Healesville hotels for a perfect stay. How Much is a Hotel Room in Healesville? Hotels in Healesville start at AU$100 per night. Prices and availability subject to change. Additional terms may apply. Gorgeous setting, lovely luxury touches. Mandy is a delightful host. The room was spacious, modern and very clean. The whole place is very new, funky and easy to get around. Had dinner at the Bar & Grill which was fantastic! Buffet brekky at the cafe was good but there are nice surrounding cafes to try too. Thouroughly enjoyed our stay here.